Basil Walnut Pesto, as the name suggests is a pesto sauce made from fresh basil leaves, walnuts and olive oil. Pesto has its origin in Genoa in Liguria, Italy. Traditionally, it was made by pounding basil leaves, pine nuts, garlic, olive oil, and parmesan cheese in a pestle and mortar. But, today many variations are popular across the world. With gadgets like mixer grinders and food processors at our disposal now, people seldom make it by pounding it in a pestle and mortar. Making pesto at home is an easy task today, all thanks to the technological advancements. Once you have made it yourself, you will never buy a jar from the supermarket. That's for sure. I generally make pesto using either walnuts or almonds. Pine nuts are not easily available in stores in India. Some speciality stores do keep them, but it is mostly exorbitantly priced. Thankfully, walnuts or almonds or for that matter any nut can do the job perfectly well. I make it without parmesan cheese - one reason being that parmesan cheese is not easily available here and second is that parmesan cheese has animal rennet and is not considered vegetarian. I have heard that a vegetarian variety is also available these days, but I don't seem to care. I have come to love the pesto I make without parmesan cheese. To the uninitiated, pesto is just like our Indian Green Chutney in process. Just blend all the ingredients and it is ready. I used this basil walnut pesto to make bruschetta and some of it went into making penne pasta with pesto sauce. Even my little one liked it! This pesto keeps well for 5 to 7 days. Keep it covered with olive oil. The surface might turn a few shades darker - just stir it and use it. It can be frozen too. But, I like my food fresh always and seldom freeze it. 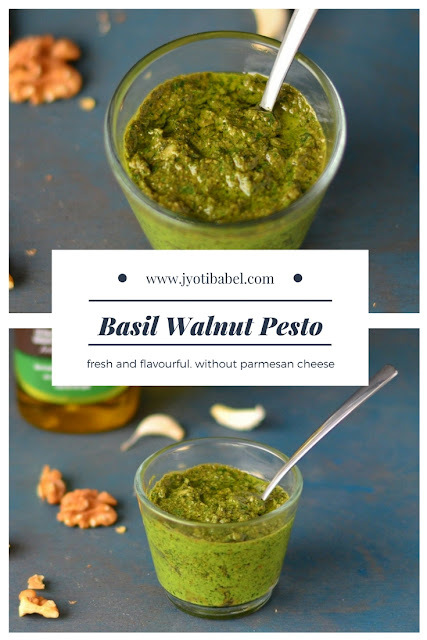 Let's now check out my recipe for Basil Walnut Pesto here. 1. Use the chutney jar of your mixer and add basil and walnuts to it. Add garlic, salt and half of the olive oil. Blend it to a paste. 2. Scrap down from the sides, add little more olive oil and blend again. The walnuts will also release its oil to give a creamy pesto. 3. Add the last bit of olive oil, scrap the pesto from the sides and churn it one last time. Adjust seasoning if needed. Your basil walnut pesto is ready. 4. Store it in a glass container and top the surface with some more olive oil. 5. You can smear it over toasted bread slices, make bruschetta or use it in making pasta dishes. Enjoy! 1. You can use almonds in lieu of walnuts. Making pesto in a mortar and pestle gives the pesto a wonderful texture , I like this pesto , and definitely walnuts is a very good substitute . Even I make pesto with walnuts and with cheese. Depending on how I use it, I add cheese later. 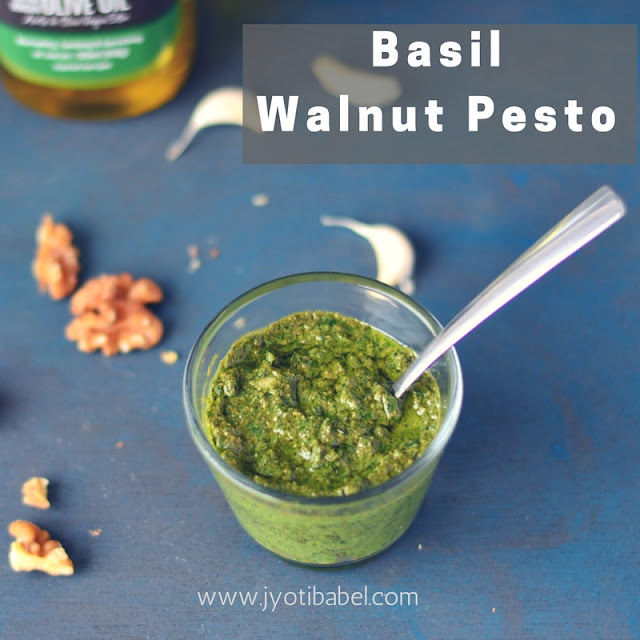 This something I would love to add to my white pasta .. pesto looks so flavorful and love the vibrant green color jyothi.. Pesto with walnuts are always delicious .. Yes you are right Parmesan cheese contains animal rennet in it we do get vegan parmesan cheese..
Good one. I stay away from parmesan cheese for the same reason. 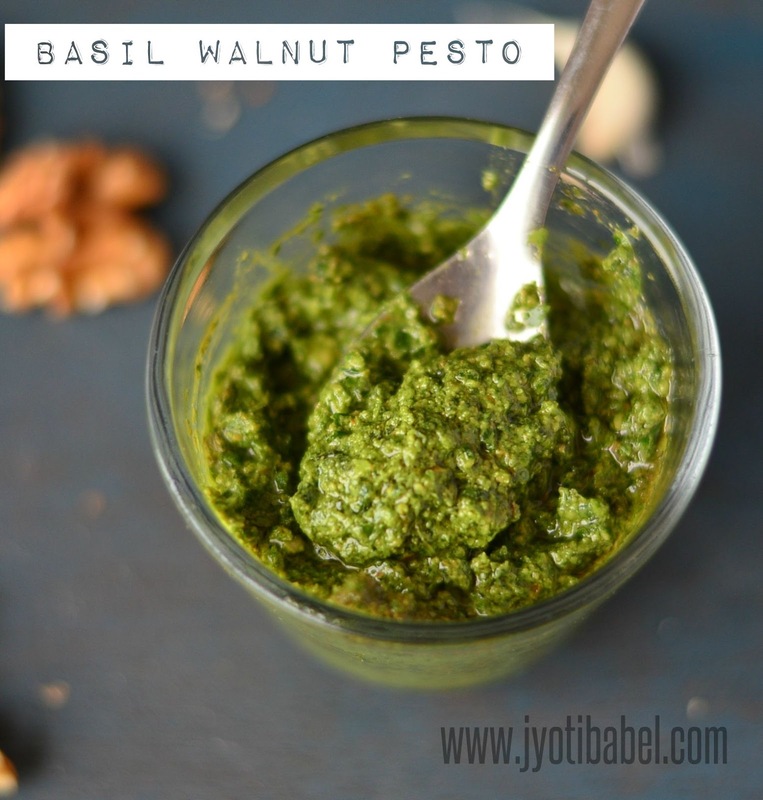 I should try this basil walnut pesto sometime. Cant imagine Italian cuisine without pestos. Just love to have some spaghetti with this aromatic pesto sauce. Pestos are the best raw and flavorful sauces full of health benefits too. Love the clicks and the color of this pesto. This is a great pesto for those with lactose intolerance. One of my favorite ways to use pesto is on pizzas. I like it even better than the usual marinara sauce. Beautiful color. what a lovely green, can imagine that sharp taste of basil and creamy walnuts!! Love pestos for their simplicity and versatility!! looks tempting!!! Oh wow, the Pesto is rocking! Perfect colour and texture. I often end up with Chutney like smooth paste. Yous is tooo Good..